I can send on software serial, but not read? I've been cracking my head over this for a long while. The listen function is used out of pure desperation. How do I fix this? This should be working right? Since I want to be sending AT commands to the bluetooth modules at some time and read their output, getting this to work is really important. Possibly the built-in UART (Hardware Serial) assigned to the same pins is interfering with SoftwareSerial? If you really want to us SoftwareSerial, try it on a pair of pins that has no hardware UART attached. And/or try SoftwareSerial (again, on a non-UART pair of pins) to connect to your PC (after uploading; you can't upload with it), and use Serial1 to connect to your device. This isn't the recommended or easiest way but it might help debug the problems you're seeing. If SoftwareSerial is not working then simply do not use it. You shouldn't be using it anyway. You have a Mega with 4 UARTs. You are using a pair of the UART pins, and yet you are using SoftwareSerial. instead use the SerialX object (where X is the number by the TX and RX for the pins) to communicate. SoftwareSerial is only for those times when you don't have enough hardware UARTs, and you have plenty. On Mega you don't need to use SoftwareSerial. Mega has 4 Serials. Connect the module to RX3/TX3 like on the Fritzing in your question and use Serial3 in sketch. Not the answer you're looking for? Browse other questions tagged arduino-mega bluetooth softwareserial or ask your own question. 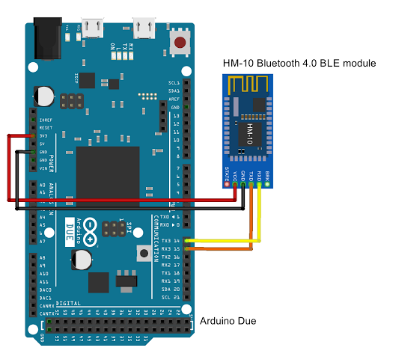 how to send data to Adafruit Bluefruit Feather (32u4) over bluetooth?